As a PCB manufacturer, you are almost certainly now producing controlled impedance PCBs for your customers – it is estimated that these types of boards account for some 70% of the market. But how do you verify the PCBs' characteristics, control your production process and demonstrate quality conformance to your customers? The CITS880 is the eighth generation of Impedance test system from Polar, and typically the most popular model for customers who are new to impedance control. The CITS880 provides both differential and single ended measurement capability along with 4 channels to provide flexible probe connection. Controlled impedance PCBs are used across a broad range of applications to help ensure high frequency signal integrity. Designers invariably specify these types of PCBs whenever the edge speeds of digital signals are faster than 1ns, or analog signals climb above 300MHz. The characteristic impedance of a PCB trace is determined by the dimensions of the trace and the properties of the PCB material – which can vary from batch to batch. To control trace impedance PCB manufacturers usually vary trace width to compensate for different batches of PCB material. Historically, they were then forced to use specialist laboratory equipment such as a time domain reflectometer (TDR) to measure the characteristics of a representative trace etched on the board or a test coupon. This approach was complex, expensive and far from ideal in a production environment. Many electronics designers – especially those pushing performance boundaries in the defense/aerospace, communications and IT industries – are now taking controlled impedance PCBs a stage further by using differential signals and balanced traces to improve noise immunity and reduce timing errors on very high speed interconnects. For PCB manufacturers serving these rapidly-growing electronics sectors, verifying the differential impedance of these balanced traces is now a simple task. 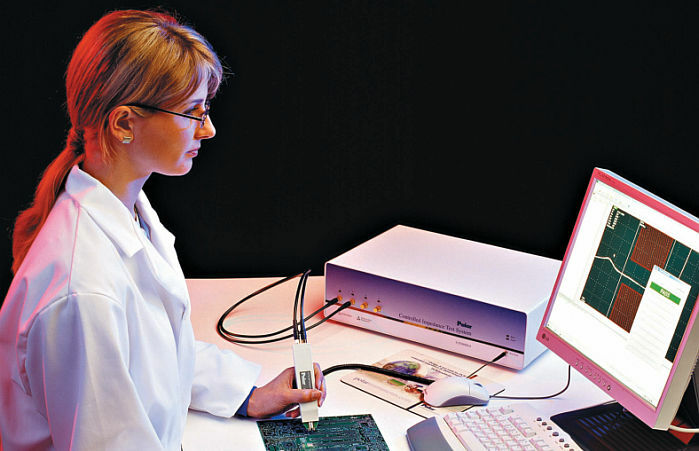 Polar produces a comprehensive range of special test probes, including the IPD-100 differential model shown here. An innovative variable pitch model, known as the IP-50V, is also available for laboratory use. Polar's Coupon Generator will enable you to design your test coupons using a range of styles and probe foot prints. For a full selection of probe foot prints please refer to Application Note AP146. CITS impedance test systems are exceptionally easy to use. Powerful Windows-based software automates every aspect of testing, enabling the entire process to be controlled by a single click of a mouse or footswitch. You simply position the microstrip probes, select a test file containing the normal PCB test impedance and tolerance, and press the footswitch. There is no requirement to perform any of the adjustments that are conventionally associated with complex TDR measurements such as setting-up vertical gains, pulse time delays and timebase values. For maximum throughput, the CITS can execute a series of impedance tests automatically, prompting you to reposition the probes as appropriate. Test results are simple to understand – the CITS automatically processes the data to produce an unambiguous display of characteristic impedance vs distance, and provides clear visual indication of pass/fail status. Automatic datalogging enables test results – together with system set-up data and measurement criteria – to be easily exported to a wide variety of third-party database or spreadsheet packages for real-time statistical process control. The pass/fail status of each test is also made available via opto-isolated signals on the instrument's rear panel, facilitating integration with other factory automation equipment. Traceable measurement accuracy complements the CITS simplicity of operation. Furthermore, QA specialists still have the freedom to specify complex measurement parameters as well as standard test functions like pass/fail limits, result handling and data logging. Multi point calibration with reference air lines ensures traceable impedance measurements from under 28 Ohms single ended to over 150 Ohms differential. You can print test results to provide conformance reports for your customers, store the data on disk for archive purposes or future analysis, or export it for real-time SPC purposes. An optional datalog report generator (DRG) accommodates a wide variety of standard forms, for simplicity of reporting. A barcode reader is also available as an option, which enables PCB identification labels to be scanned-in during the test process, reducing handling time and eliminating error. When considering starting impedance controlled production you will also find the Polar Si8000m controlled impedance design system helps you tailor your customers designs to your production process. It is also ideal in helping your front end team to optimise the incoming data for maximum controlled impedance yield. Working with both CITS and Si8000m will give you a complete solution for impedance test and process control. Speedstack layer stackup software can now directly export CITS880 test programs from a controlled impedance stackup. The CITS DRG Datalog report generator option allows you to deliver finished measurement result reports in a professional format. Technical help and CITS880 software maintenance is now offered through the Polarcare for CITS maintenance and support program. Sensitive electronic test equipment like the Polar Controlled Impedance Test Systems can prove vulnerable to damage from static electricity if proper anti-static procedures are not followed. Application Note AP8500 note looks at the best ways to prevent the build up of static charge in the work area — and avoid expensive repairs to your CITS. Occasionally, however, even in the best controlled environments there is a chance that a unit will be inadvertently exposed to electrostatic discharge events, Polarcare for CITS is an extended warranty program that offers increased cover against accidental TDR head damage both during the standard warranty period and over the full working life of your CITS.